Dental implants are one of the best possible ways to replace a missing tooth because they mimic a natural tooth in many ways. Parma dentist Rebecca Gecovich often recommends them because they look, feel, and function just like the tooth you lost. 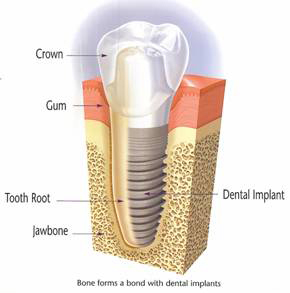 Implant: The implant itself works just as the natural root of the tooth would. It is placed in the jawbone and integrates with the bone. These are typically made of titanium or a titanium alloy for strength and durability. 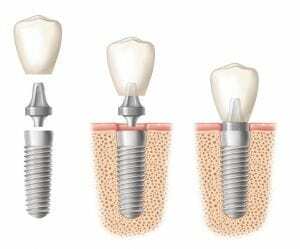 Abutment: The abutment is a center piece that connects the tooth to the implant. It’s usually made out of metal and screws onto the root form and becomes a solid base for the crown to attach to. Crown: The crown is the only part that can be seen. It’s designed to match the shape and color of your other teeth, so it blends seamlessly, and nobody can tell it’s a “false” tooth. What Makes Dental Implants a Good Choice? Other missing tooth replacements don’t have a component that resembles a root. Because of this, the jawbone begins to get dissolved away in the area where the tooth was lost. If it’s a single tooth that’s missing, the bone in just that spot will be resorbed. If multiple teeth are missing, the entire area will start to dissolve away. At this point, the face can start to look sunken in, which makes people look older than they are and can cause other dental issues. In addition to this, dental implants tend to be a “no-fuss” solution because they’re designed to stay in place. You’ll clean it and care for yours just like you would a natural tooth, and it will look like one too. Dr. Gecovich typically works with specialists she knows and trusts when she recommends a dental implant be placed. Known as periodontists, these specialty dentists undergo additional schooling to become experts in the structures that support teeth. In most cases, it will be the periodontist who performs the surgical placement of your dental implant. Following this, you’ll undergo a period of healing while the bone fuses to the implant. One the healing process is complete, Dr. Gecovich will finish the process by creating and placing the crown. Most people, if they have a missing tooth, can candidates for dental implants, but sometimes certain health conditions and budgets can make them the less ideal choice. If you’re interested in any kind of missing tooth replacement, Dr. Gecovich will walk you through all available treatments, so you can choose the option that’s right for you. To schedule a consultation, please fill out our online form or call us directly.